Drawing of a gray rat nibbling on some straw. 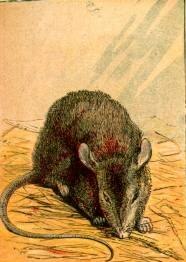 This vintage, public domain rat image depicts a rat that is neither menacing or overly cute which makes it a great image for just about any occasion. This vintage illustrator and a number of others were drawn by Joseph Martin Kronheim (1810-1896) for My First Picture Book.